The foreign ministers of Britain, France and Germany hailed a new mechanism to ease trade with Iran despite U.S. sanctions as a sign of their commitment to the 2015 nuclear deal with Tehran. "It is a political act," French Foreign Minister Jean-Yves Le Drian told reporters after a meeting of EU counterparts in Bucharest. "It is a gesture to protect European companies." 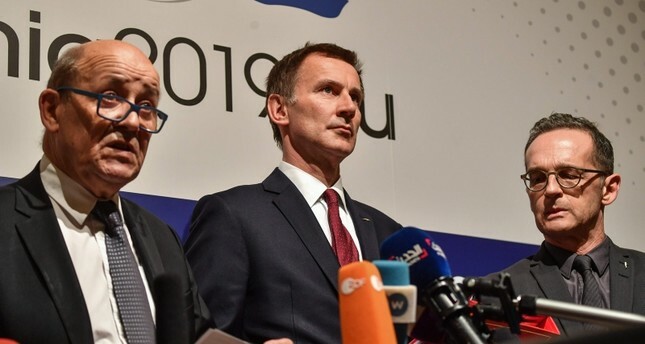 Britain's Jeremy Hunt said the three countries were working closely with Tehran to finalize arrangement to allow for humanitarian, pharmaceutical, agricultural and consumer trade. "Registration is a big step, but there is still more work to be done," Hunt said. Iran's Foreign Minister Javad Zarif welcomed the news as a "long overdue first step." But U.S. officials dismissed the idea that the new entity would have any impact on efforts to exert economic pressure on Tehran, and fired a fresh warning at anyone thinking of trading with the Islamic republic. Hunt said the move was "a clear, practical demonstration" of Europe's commitment to continuing the nuclear deal, but insisted it "does not in any way preclude us from addressing Iran's hostile and destabilizing activities." Europe has toughened its tone on Iran's ballistic missile program, human rights record and interference in Middle East conflicts. EU diplomatic chief Federica Mogherini, who has led the bloc's efforts to save the nuclear deal, said INSTEX was "essential for the continued full implementation of the nuclear deal." While it is aimed at small and medium-sized companies, the French source said it would send an important message to Iran about Europe's commitment to keep the nuclear deal alive. The U.N. atomic agency has certified Iran's compliance with its obligations 13 times and even the head of the CIA said this week that Tehran was abiding by the accord -- drawing a furious response from Trump. Joseph Giordono-Scholz, spokesman for the U.S. embassy in Berlin, insisted INSTEX would not undermine America's economic campaign against Tehran. "Entities that continue to engage in sanctionable activity involving Iran risk severe consequences that could include losing access to the U.S. financial system and the ability to do business with the United States or U.S. companies," he said. A number of major international companies have already pulled out of Iran in the face of dire warnings that the U.S. will vigorously pursue any company breaching the sanctions regime. The launch of INSTEX comes with EU countries growing increasingly concerned about Tehran's ballistic missile program, as well as its human rights record, its interference in Middle East conflicts and recent attempted attacks against opposition groups in Europe.